Here are more new, original and sensational mental effects, brought to you by many foremost mentalists. A wide variety of time proven, audience tested effects are included. Several of the effects were formerly catalogued and sold by their originators for several dollars each. 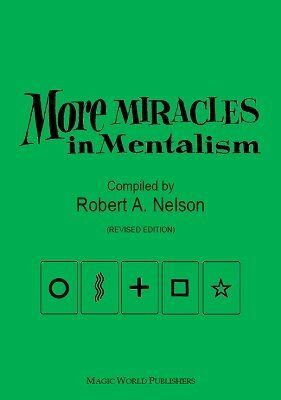 Now get them all in this fine ebook, the second in the series of "Miracles in Mentalism." Many effects are one person presentations and include full patter. Little or no apparatus is required to do these More Miracles in Mentalism . Bob Nelson has selected the best of the various contributors' favorite effects and sequenced them into a complete Mental and Psychic Program. Your library is not complete without this book. Are you a Nelson collector? This book was listed as No. 674 in the Nelson Enterprises catalog . 1st edition 1959, PDF 74 pages.